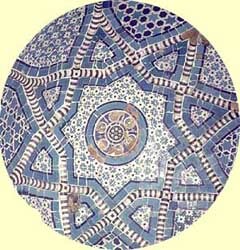 If it is said that a paradise is to be seen in this world, then the paradise of this world is Samarkand. Samarkand is one of the oldest and most important cities amongst the many in the historic region of Central Asia known as Transoxiana. Located in the Zerafshan River valley, the city enjoys the benefits of abundant natural resources and occupies as well a key place on the trade routes of Central Asia. The Zerafshan is fed by the snow melt from mountains to the south and east (shown here from the air) and flows into the Oxus (Amu Darya). To travel upstream just above the fertile valley floor (second photo), brings one to the historic city of Panjikent. Downstream is Bukhara. Those who ruled Samarkand developed a complex network of irrigation channels, as shown in this map. As we know from the authors of historic accounts, its surroundings also provided pastureland, something that is evident even today if we look south from the highlands to the east of the city. While settlement in the region goes well back into pre-historic times, by the seventh century before the Common Era (BCE or B.C. ), the town seems to have housed a substantial center of craft production and already boasted an extensive irrigation system. It was one of the easternmost administrative centers for Achaemenid Persia and had a citadel and strong fortifications. Alexander the Great knew it as Maracanda; at the time when it submitted to him in 329 BCE, the city occupied some 13 sq. km. Damaged during a rebellion which Alexander had to suppress, the city revived; in the third and second centuries BCE, it contained some very impressive buildings. Alexander's conquests introduced into Central Asia Classical Greek culture; at least for a time the Greek models were followed closely by the local artisans. The Greek legacy lived on in the various "Graeco-Bactrian" kingdoms of the area and the Kushan Empire of the first centuries of the Common Era whose territories extended well down into what is today Pakistan and India. During the Kushan era the city declined though; it did not really revive until the fifth century CE. The museum located today on the hill known as Afrasiab, the site of the ancient city, contains numerous examples of pottery from the period of the city's history prior to the Muslim conquest. When the Arabs invaded Central Asia in the early eighth century, the last of the Sogdian rulers of the many small states in the Zerafshan Valley fled upriver from Panjikent. Amid the ostensibly stark ruins of Panjikent are houses whose walls were decorated with murals portraying a religious ceremonies, scenes from the famous Persian epics and much more evidence of the cosmopolitan cultural connections of the last Sogdian state. The last refuge of the Sogdians was a fortress upstream at Mt. Mug, where archaeologists have unearthed a treasure trove of Sogdian documents attesting to the sophistication of their administration and legal system. In Samarkand itself, even after the Arab conquest, the center of the city continued to be located on Afrasiab, seen here as a dusty mound in the distance as one looks west toward the modern city. A sense of its topography is provided by this model of the ruins, viewed from the south, and a schematic map shows the rings of fortifications and the ponds and canal system from some time in the Islamic period. P.D. Voronikhin's drawing reconstructing the upper fortified area of the city provides a vivid impression of a very substantial town. Excavations have uncovered the foundations and lower parts of the walls of what appears to have been the palace of the pre-Muslim Sogdian rulers. As in Panjikent, the walls were covered with brilliant murals, whose fragments shown here seem to illustrate a wedding procession, attended by ambassadors bearing gifts, a diplomatic ceremony, in which the figure at the head of the procession may be the Sogdian ruler, and scenes from the royal hunt. Another painting shows a Chinese princess being conveyed across a river in a boat. In the first two examples, following photographs of the actual paintings in the Afrasiab Museum are modern artists' reproductions of the images which give a clearer sense of what is depicted. The robes of the important personages reflect the influence of Sasanian (Iranian) designs. Two examples from other palaces in Transoxiana from this same period (the images are reproduction paintings, filmed in substandard light in the Samarkand museum) provide an additional sense of the cultural connections of these prosperous Central Asian states. There is considerable evidence in the paintings, other archaeological material and written sources concerning the fact that several religions were practiced in Afrasiab. The excavations have revealed fire altars from private homes and fragments of ossuaries (the examples of the latter here are from different sites in Central Asia). Such evidence points clearly to the importance of Zoroastrianism, which we know was widespread especially in areas which had been under Persian control. Xuanzang's biographer reports that during the monk's visit in 631, Zoroastrian priests chased two of his Buddhist followers. Although Xuanzang claimed some success in preaching Buddhism, there were apparently only two Buddhist temples left in the city at that time. We know, however, that Soghdians were among the translators of Buddhist scriptures in China, presumably because they had linguistic skills honed by life at the crossroads of major trade routes connecting China with India via Central Asia. It seems clear that the Soghdians were quite eclectic in their religious tastes, since motifs on some of the ossuaries mix Zoroastrian and Christian symbolism. In fact there was a Christian Nestorian bishopric in Samarkand as early as the sixth century. The wall paintings at Panjikent depict various goddesses and religious scenes, some even showing influences of Hinduism and others including local Central Asian deities not connected with one of the other major regions. During the eighth century, because of their important economic role in the Uighur state which rose to power along the northern borders of Tang China, Sogdians may well have been the ones who persuaded the Uighur rulers to convert to Manichaeism. Archaeologists have found in the Uighur cities Manichaean and Nestorian texts written in Sogdian. For some time after the Muslim conquest of the early eighth century, these eclectic local religious traditions remained the dominant ones. There is considerable evidence that rebellions against Arab rule often were connected with the emergence of local religious leaders who seem to have drawn heavily on Zoroastrian and Manichaean traditions. Firm Arab control in the region was not established before the middle of the eighth century (CE), and a century after that, Samarkand came under the control first of the Samanid and then the Karakhanid states. The Samanids, who were of Iranian origin, established Bukhara as their capital, and it was under their rule (to about the end of the ninth century) that the cities of Transoxiana became major centers of Muslim learning. A group of Samanid memorial stones can be seen today on a platform just in back of the Registan. Like most successful rulers of the city, the Samanids invested in the irrigation system. A reconstruction of the possible appearance of one of the major aqueducts into the city can be seen on the left. Unfortunately, little remains of the architecture from this period in Samarkand. Fragments of a Karakhanid-era minaret and mausoleum may be seen in the oldest of the shrines of the Shah-i Zinde (see the photographs and discussion there). The Persian chronicler Juvaini's encomium to Samarkand and other Central Asian cities reflects his dismay at the destruction wrought by the Mongols when Chingis Khan invaded the area in 1220. Only fragments of the walls remained, such as these (on the right in the picture), which formed the southern boundary of the city near the mausoleum complex of Shah-i Zinde. Many of the Central Asian cities quickly recovered from the Mongol invasion. According to Juvayni, no admirer of the Mongols, Bukhara was one, although by the early 1330s the famous Arab traveler Ibn Battuta noted "at the present time its mosques, colleges and bazaars are in ruins, all but a few"--the result apparently of subsequent wars. Ibn Battuta also visited Samarkand, "one of the greatest and finest of cities, and most perfect of them in beauty," where he similarly noted that "there were formerly great palaces on [the river's] bank, and constructions which bear witness to the lofty aspirations of the townsfolk, but most of this is obliterated, and most of the city itself has also fallen into ruin. It has no city wall, and no gates, and there are gardens inside it." began at speed, causing all the houses to be thrown down along the line that his Highness had indicated for the passage of the new street. No heed was paid to the complaint of persons to whom the property here might belong, and those whose houses thus were demolished suddenly had to quit with no warning, carrying away with them their goods and chattels as best they might. No sooner had all the houses been thrown down than the master builders came and laid out the broad new street, erecting shops on the one side and opposite, placing before each a high stone bench that was topped with white slabs. Each shop had two chambers, front and back, and the street way was arched over with a domed roof in which were windows to let the light through...At intervals down the street were erected water fountains. The main axis of the Timurid city stretched southwest from Afrasiab, passing the Bibi Khanum Mosque and Mausoleum complexes, then the Registan, and ending near the Gur-i Mir Mausoleum. The development of this urban center continued apace under Tamerlane's grandson Ulughbeg, who ruled the city for much of the first half of the fifteenth century until he was assassinated in 1449. Ulughbeg is well known for his scientific investigations, supported by the Observatory he built on the hills to the east of Afrasiab and the madrasa (school) he erected on the Registan. The major architectural ensembles of Samarkand, notably those from the Timurid period, will be explored on separate web pages. The first three, on the Shah-i Zinde, Ulughbeg and his observatory, and the Bibi Khanum Mosque, are already available on Silk Road Seattle. Pages will be added for the Gur-i Mir Mausoleum and the Registan. For a good survey of Timurid history, see the University of Calgary History Department's pages from its "Islamic World to 1600." For a documented overview of "Timurid Architecture in Samarkand" but one not illustrated with many photos, see Mark Dickens' Oxus Central Asia Site. Copyright © 2001 Daniel C. Waugh.